At Fiix we’re committed to sincere social change, and a big part of this is taking care of the planet. That’s a pretty lofty goal, but going carbon neutral was an easy first step for us to take. And—exciting news—we did it! We recently got our carbon neutral certification from Carbonzero. But what does that actually mean and how did we get here? 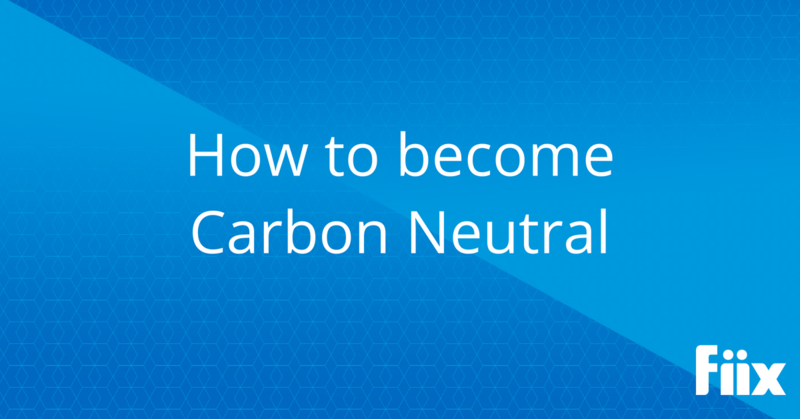 Read on for our top tips on becoming a certified carbon neutral organization. Climate change is a hot topic these days. For years, we’ve run our lifestyles on fossil fuels, emitting 40% more carbon dioxide into the atmosphere than before the industrial revolution. If we stay on this path, greenhouse gases will skyrocket, amplifying the heat trapped in our atmosphere and causing a whirlwind of global environmental change. Going carbon neutral is one way to help fight these changes and do your part to create a sustainable future. It’s just basic math: The carbon emissions you add into the atmosphere through business activity can be subtracted by purchasing carbon offsets. Offsets are emission reductions for each ton of CO2 we put into the atmosphere. These reductions can be achieved through various projects such as organics biodigestion, renewable energy, forestry, wind farms, and more. Not all carbon offsets are created equal. That’s why the David Suzuki Foundation and The Pembina Institute put together a guide for consumers, businesses, and organizations. It shows you what an offset is, how they are assessed, how they are measured, and how they differ. The services offered by carbon offsetters vary, but most companies provide a standard energy audit, a report, and a carbon neutral certification. Others may include more in their assessment, including: waste composition, reduction recommendations, sustainability training for staff, and more. The carbon offset guide mentioned above compares offset vendors in a table based on additionality, auditing, unique ownership, permanence, vendor transparency, and public education. Compare what offsets each vendor offers, and contact the one that works best for you. Once the audit is complete, you will receive a certification number that is verified by a registry—the CSA Group registers companies that are carbon neutral. Now that you know what your emissions are, it’s time to offset! To do this, you will need to choose a project. Fiix chose to go with the Dufferin Biodigestion Project where methane is captured and used for energy, but there are loads of different projects you can participate in. The overarching goal here is reducing your carbon footprint as much as possible. Going carbon neutral is one tool in the toolbox, but make sure you educate employees on how to reduce emissions, on top of any carbon offsetting your business takes on. Providing your employees with hard data on carbon emissions is a very tangible way to have them reduce their environmental impact at the office and, in turn, reduce the company’s footprint. Show employees the composition of your footprint, what the company is doing about it, and how they can help. Odds are, they will take these habits out of the office and make changes in their own homes. Carbon offsets aren’t a “set it and forget it” situation. As your business (and your consumption) grows, your emissions change. That’s why an annual audit is essential for making sure carbon emissions are always neutral. To find out more about Fiix’s CSR policy, and our commitment to people, profit, and planet, check out our CSR page.